Sergey Sobyanin congratulated the Aam Aadmi Party leader on his assuming the role of chief minister of Delhi and offered to broaden cooperation between the capital cities. Indian political upstart Arvind Kejriwal received a message of congratulations on his assuming the role of Delhi’s chief minister from Moscow Mayor Sergey Sobyanin, the Russian Embassy in the Indian capital said. “I am looking forward to further development of the multidimensional cooperation between Moscow and Delhi, which naturally supplements and contributes to the strengthening of the Russian-Indian special strategic and privileged partnership,” Sobyanin wrote to Kejriwal. In the recent Delhi state elections, Kejriwal’s Aam Aadmi Party (AAP) won 28 of the 70 available seats. 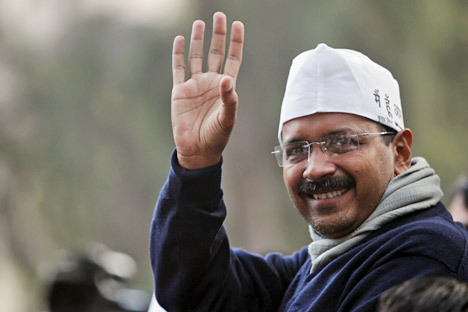 Kejriwal defeated incumbent Chief Minister Sheila Dikshit in her constituency of New Delhi. Sobyanin wished Kejriwal “good health and great success,” while wishing “peace and prosperity” to the people of Delhi. Moscow and Delhi, which are sister cities, have a long history of cooperation. Kejriwal’s predecessor Sheila Dixit visited the Russian capital on a few occasions to explore collaboration between the cities. In 2011, the Moscow City Government and the Delhi Legislative Assembly agreed on a programme to step up ties for the years 2012 to 2014. In 2012, ahead of Vladimir Putin’s visit to India for the 13th annual summit, Delhi hosted the ‘Days of Moscow’ festival, which comprised of cultural programmes, but also included a roundtable of civic issues. The cities signed a pact that seeks to enhance cooperation in 11 areas including culture, healthcare, education, housing and utilities, transport management and economic trade and policy. “For Moscow, which has just expanded territorially, Delhi’s experience of developing its city territory is interesting... The metro system is being actively built in the Indian capital. Moscow has also announced its ambitious plans of developing new metro lines,” Sergey Cheryomin, the head of the Moscow foreign economic and international relations department had said in Delhi during the festival. The two cities will have regular consultations and exchanges in 2014.